Click here to read our August 2017 Newsletter, featuring a classic Jessie Oonark print and discussing our relaunched website. The gallery is no longer open for business at 1065 Madison Avenue. We will be there irregularly from now until the end of September, but the bulk of our inventory has been packed and shipped. We are in the process of rethinking our website. For the time being, we have left our curated exhibitions on display on the website, but most of these works are no longer available for purchase. When the website is relaunched, we will send out a newsletter. If you are not on our newsletter list and wish to be, please click on "Contact" and fill in the "Newsletter signup" form. 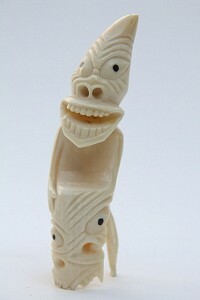 We are still happy to talk with you, consult on Inuit art, provide insurance appraisals, and answer questions. Are brick-and-mortar galleries going the way of the dinosaurs? We bought Alaska on Madison almost five years ago, and we have reluctantly concluded that it is not economically viable. Wednesday, August 17 is the last day that we will be taking orders. Most of our inventory will be leaving the gallery shortly after that. We thank our loyal customers for their support. We have enjoyed meeting and talking with you, and we hope that your love for indigenous Northern art continues to flourish. 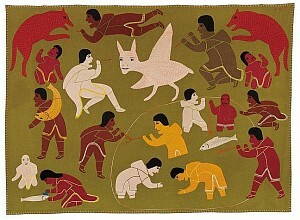 A number of you have asked where you will be able to look for high quality Inuit and Northwest Coast art after our gallery closes. We will maintain our website, www.alaskaonmadison.com, although there will be a period when it is down for re-thinking and refurbishment. We will send out an announcement when it has been reincarnated. We would be happy to assist you with inquiries, with searches for particular pieces or artists, and with organizing your collections. Our artist search tool will continue to be available on our website, and we would be delighted to help you use it. We would be pleased to answer questions or just chat. You can contact us by email at alaskaonmadison@gmail.com . We will send out occasional newsletters. 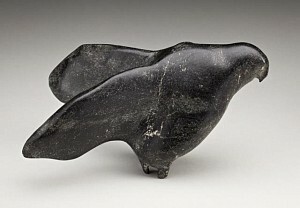 With respect to other sources for Inuit art, the galleries whose curatorial sensibility was most appealing to us when we were collecting (in addition to Alaska on Madison) were Galerie Elca London, Feheley Fine Arts and Spiritwrestler. 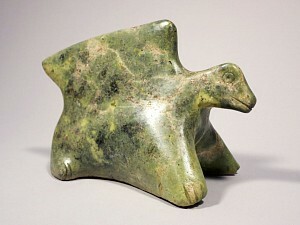 Knowledgeable collectors can find some excellent pieces at auction. 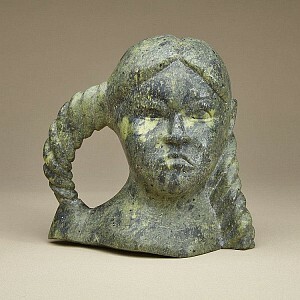 Walker's Auctions and Waddington's Auctions have regular auctions featuring Inuit art, and several other Canadian auction houses frequently include Inuit art in their general auctions. If you are not comfortable with the auction process, we would be pleased to assist you. Just to state the obvious, however, galleries can only keep their doors open if collectors patronize them. If everyone on our email list had purchased just one sculpture every other year, we would not be closing. So please remember that every purchase you make from a gallery is important to keeping galleries available as a resource for collectors. 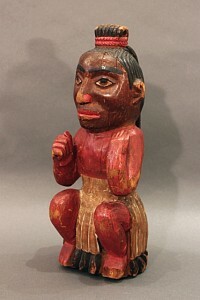 Click here to read our June 2016 Newsletter, which features an exquisite 19th century Haida carved and painted wooden shaman figure. Click here to read our May 2016 newsletter, which features an appreciation of Victoria Mamnaguqsualuq's work. Click here to read our April 2016 Newsletter, which features a new exhibition, "One Collector's Vision: Inuit Prints 1960-1996." 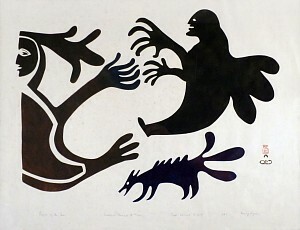 The exhibition comprises 21 prints from Cape Dorset, Baker Lake and Povungnituk, including some classic, much sought-after images. Click here to read our March 2016 Newsletter, which features a collection of tupilaks and work by Abraham Anghik Ruben. 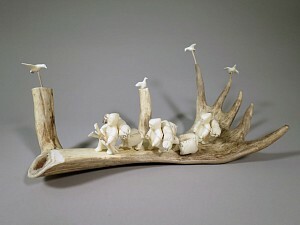 Our February 2016 Newsletter features works that use antler as a principal design element, and mourns the passing of Jutai Toonoo. Click here to read the newsletter. Click here to read our January 2016 newsletter, which features a wonderful 1950's hawk and a memorial to Tuna Iquliq. 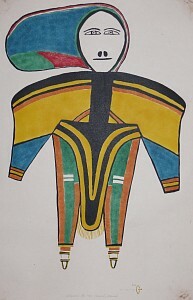 Click here to read our December 2015 Newsletter, which features Inuit portraits.